Carte Des-Isles de la Sonde, et des Isles Moluques. 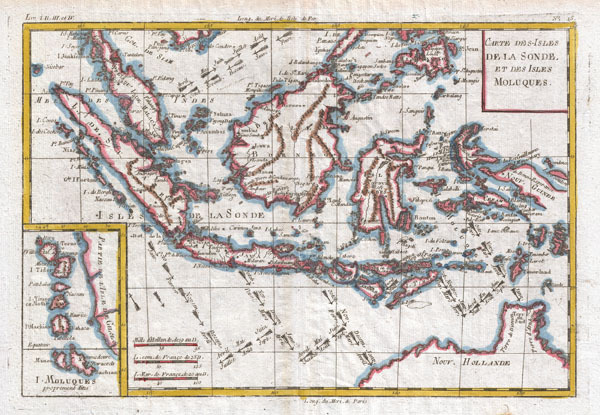 A fine example of Rigobert Bonne and Guilleme Raynal's 1780 map of the East Indies. Covers from the Malay peninsula to Australia inclusive of Sumatra, Java, Singapore, Borneo, New Guinea, and northern Australia (Nouv. Holland). Identifies the strait of SinCapura, but mot the Island of Singapore. The southern shores of New Guinea are only partially explored and here have been left blank. Arrows in the seas show the important trade winds that facilitated commerce in this region from the earliest antiquity. Includes detailed inset of Moluccas in lower left quadrant. Highly detailed, showing towns, rivers, and some topographical features. Drawn by R. Bonne for G. Raynal's Atlas de Toutes les Parties Connues du Globe Terrestre, Dressé pour l'Histoire Philosophique et Politique des Établissemens et du Commerce des Européens dans les Deux Indes.